Following the gesture of the daylight, the curriculum took an inward and more personal turn. We began exploring our own inner dimensions with less and less distraction from outer events and happenings. This part of the journey in YIP has been much anticipated, and sometimes dreaded, by those attending the program. Then, just as the sun only shows itself for 6 hours per day, as the light hits its lowest point in the year, as the fjord begins to freeze over and we have searched and begun to discover out inner selves, the participants are all thrown into the hustle and bustle of some of the capital cities in this world and their internships. This year counted 6 different locations; Sweden, Philippines, Holland, USA, South Africa and Brazil. 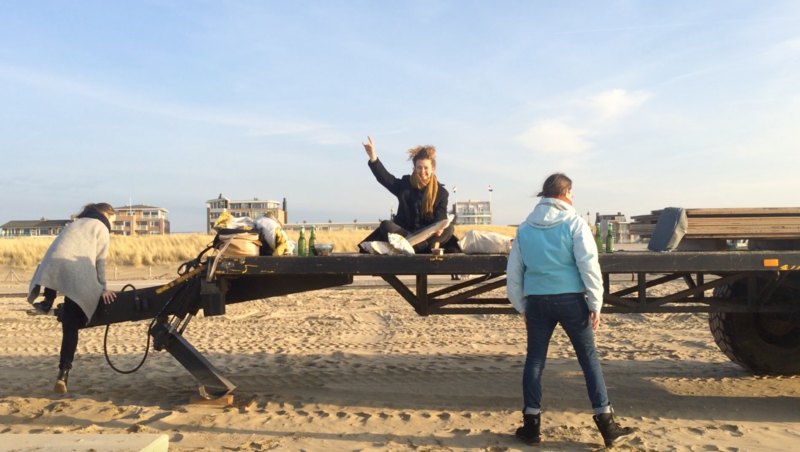 The yippies have kindly taken the time to share snapshots of their experiences with you below. Whilst the participants were on their internship adventures, the organising team had some time on their hands to plan ahead and reconsider some of the intentions and runnings of the program. It is a great gift and asset to have the time and ability to stop, reflect, learn, adjust and design the whole program from the ground up. Not only does it benefit the program and it’s design, but it gives a great base for the team to own and share the vision, purpose and striving of the education. 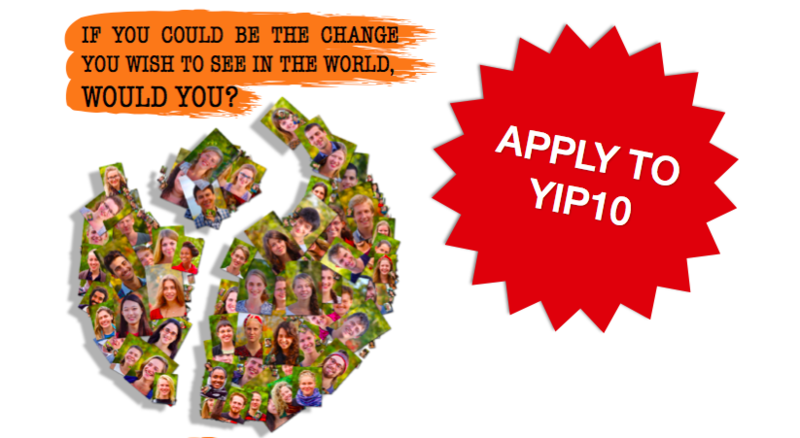 The curriculum for YIP 10 is ready, looks amazing and set to be a further evolution of the program. Next to the development of the program, there are some other exciting developments that are gaining more momentum and shape. It is very exciting and encouraging for the future to see how this initiative YIP, that grew out of a network connected to the YouthSection in Dornach, now is starting to be, create and maintain a network itself. Two members of the Organising team made it to Barcelona and the network gathering over new year. Have a look here to find out the who, what and where’s of that meeting. We are now submerged in the sights, smells and sounds of the many adventures of the internships presented by the participants to their community here in Järna and beyond via online streaming. Once the internships are rounded off, digested and shared, we enter into the block called ‘we’ or community which focusses on how we can work as a group to achieve a common goal; the Initiative Forum. Parallel to the preparation of the Forum, we are exited to welcome a group of alumni that have committed themselves to spend the month of March here in Ytterjärna to research, design and plan a second phase of YIP. 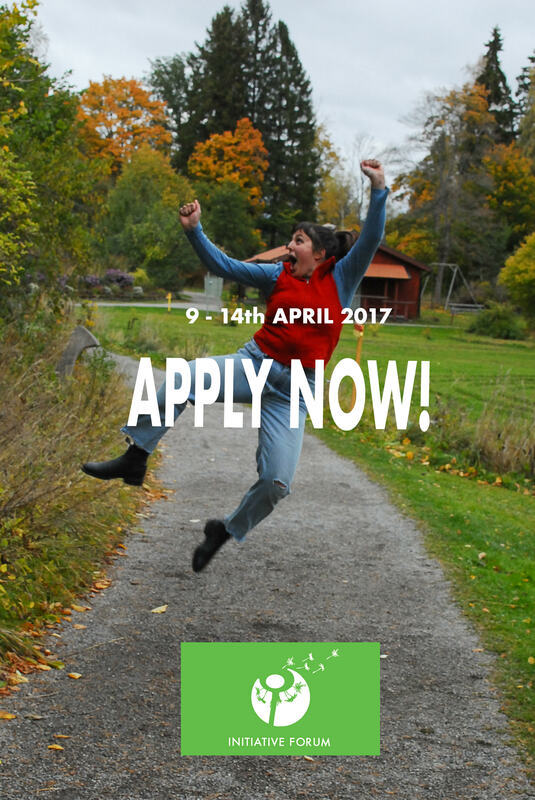 For many years now, there has been a longing for a structure/program that supports participants to transition from the Ytterjärna experience, to something more embedded in practice and ‘real-life’. These are exiting times, with YIP hubs popping up, new additions to the program being prepared, and the network finding more and more form and voice. There is so much going on at the moment that it would be too much for this newsletter. So in this writing, we’ll focus mainly on what’s happening in the program and we’ll send an intermediate newsletter, focussing more on events and initiatives in the network and amongst alumni. We start our adventure hitting the ground running, preparing for and helping to organise the walking journey Classroom Alive. 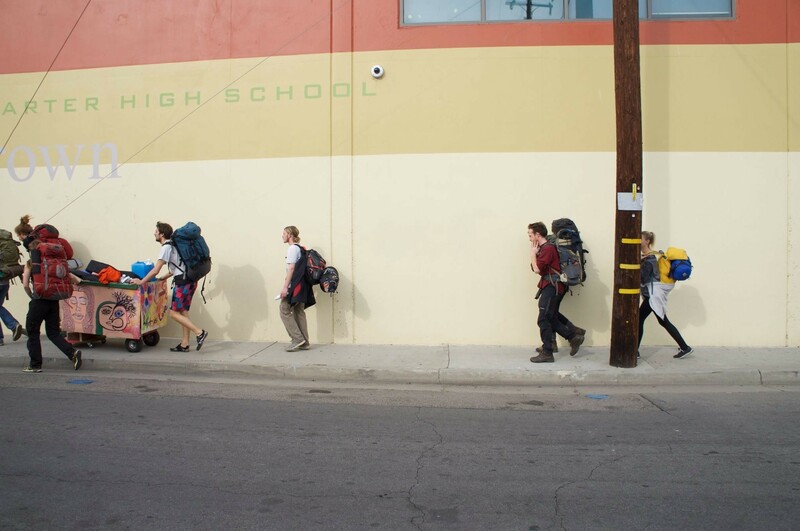 This is how we dive in to the city and our internship: hiking for 9 days from the Angeles Forest in the north, all the way southwest to Redondo Beach. Pushing a homemade “wagon” full of art supplies and instruments, we ask the question “what is love?” and invite the city to answer. Along the way, we meet various organisations, communities and people, who host us, teach us and share with us. Surprises and challenges we face head-on, as the city unfolds itself one foot at a time. After the journey, our paths take different routes. Exploring our personal questions and interests in our own way, we continue to find meaning and life lessons in our time with the city. Such incredibly diverse cultures and communities, both beautiful and ugly, not without its share of difficulties and historical horrors. Yet we seem to be continuously met with wonderful people, who have incredible stories, experience and opportunities to share. Our hosts at the Have Seeds House and Elderberries Threefold Café are a blessing. They facilitate transformation and personal development by asking the question “who do you want to become?”. Great thanks go to the incredibly supportive network in LA. Known names in the YIP such as Kiara Nagel, Frank Escamilla and Orland Bishop, as well as many, many others, gave conversation and mentorship that will have a lasting affect for life. Thank you! There are five of us, Amber, Carla, Claire, Lucilla and Rebeca. Originally we were going to be six however due to visa issues Joceline couldn’t take part in the internship, though she was a big part of the design process beforehand. The main goal of our internship was to take on the role of teachers at the Vrije Hogeschool in Zeist, The Netherlands, for 6 weeks. Before the internship started we spent two months designing a course in which we each felt represented and for which we felt passionate while also keeping a ‘red thread’ throughout so that it would make sense for our students: ‘Change is the name of the game’. Our course was focused on Global Challenges and how the millenial generation relates to them. Then we were off and away……as there were five of us we had to shift from being 5 individuals to being one teaching body, this process was long, not always pleasant and sometimes a bit painful, in short not an easy feat as we had to let go of some of our wishes and adapt to other people’s needs. We have learnt a huge amount about how communication on all levels plays a key role in the stability and smooth running of any endeavour. We also built a support web that allowed our group to stay afloat. There was always someone to hold the baton, bring another perspective and shift the narrative. Non-hierarchical team work (which was our intention) is at times incredibly hard but none of us would have made it through without each other and that is something to be very proud of. For six weeks, three Yippies plummeted deep to the southern reaches of Africa to experience the beautiful, divided and breath-taking city that is Cape Town. Greeted by the sun, we spent our time there trying our best to see how the challenges and lessons we had learnt from the cosiness of our YIP classroom in Järna translated into real-world experiences. 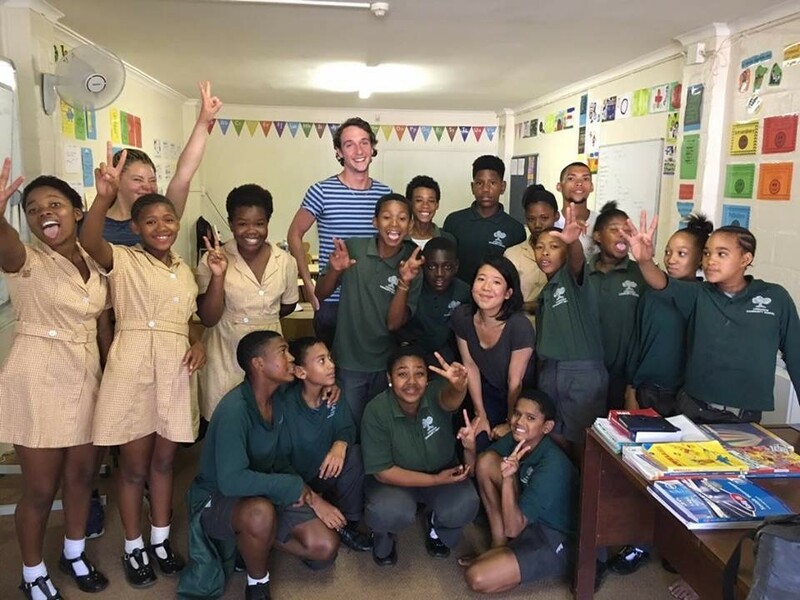 We achieved this through taking part in and observing many different initiatives: for example, we stayed in Langa Township for a week and saw the projects at work there, participated in voluntary work and observation in two major hospitals and spent a week at the Sustainability Institute, where we saw how sustainability is being communicated to both current and future generations of pioneers. It can safely be said that our time in Cape Town has been priceless; it is a place of divisiveness, conflict and poverty but these things also make it a place bursting with life, beauty and a passion for taking initiative as we have never seen it before, and we are looking forward to taking the lessons we learnt and applying them to our own communities, back up in the wintery north. We left for Manaus, Brazil, on the 10th of January. We passes through London, New York (where we briefly visited Time Square), Miami and finally Manaus, the capital of the Amazon state. There we were welcomed by Bruna Viapiana, a YIP alumni who would be co-creating this journey with us. We spent some time in Manaus learning about it’s history and traditions as well as some things about it’s current state. After our initial stay in Manaus we relocated to a place by the name of Arawak. There we launched a project focussing on a littering problem that’s present as a result of tourism. The project took form in a number of signposts and bins spread over the area. 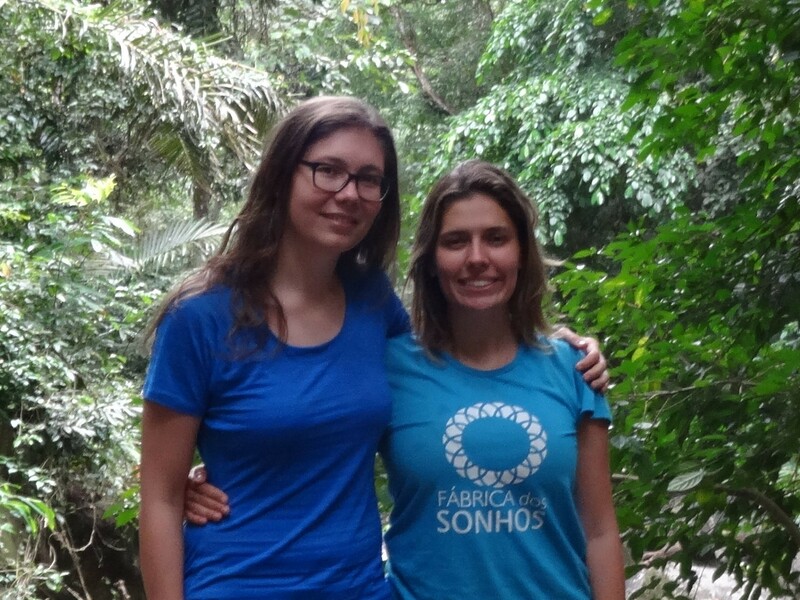 The project involved the local people and some people who had joined us from Manaus. During this time Isabel Chender joined us. She had been organising together with Bruna and would stay with us from there on. Our next stay was further out in the jungle, near a town called Anama. 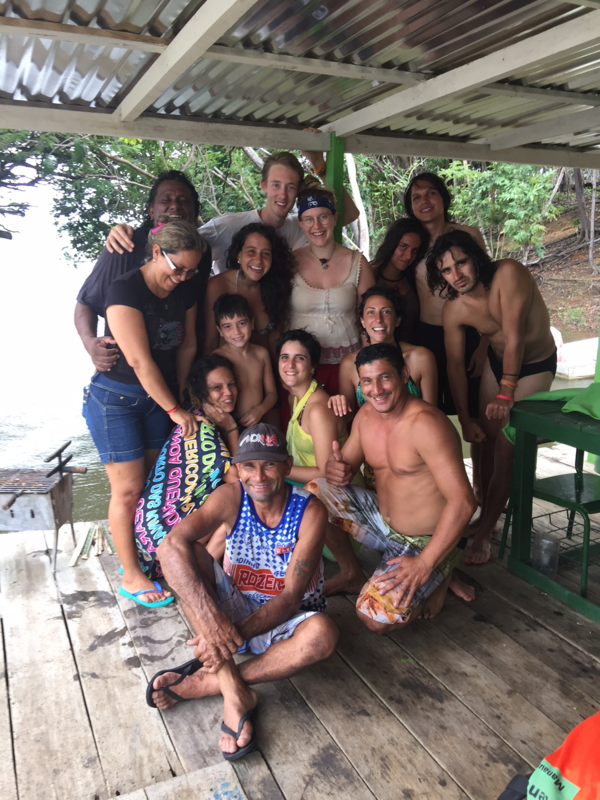 Here we were hosted by Gabriel Oliveira, a young idealist who is building up an eco-village. We engaged in many activities and experiences including harvesting, building, forestry, rituals and more. Finally we spent time in Maues, the capital of the Guarana fruit. Guarana is a plant native to the Amazon Jungle, that has nourishing, enhancing and medicinal qualities. This fruit has a large role in shaping the current state of the Amazonas province. The beauty of the country and the warm-heartedness of the Brazilian people was remarkable and we gained many new experiences and tools that will stay with us for times to come. For my internship I worked with “move it”, part of the social justice organisation (IM). 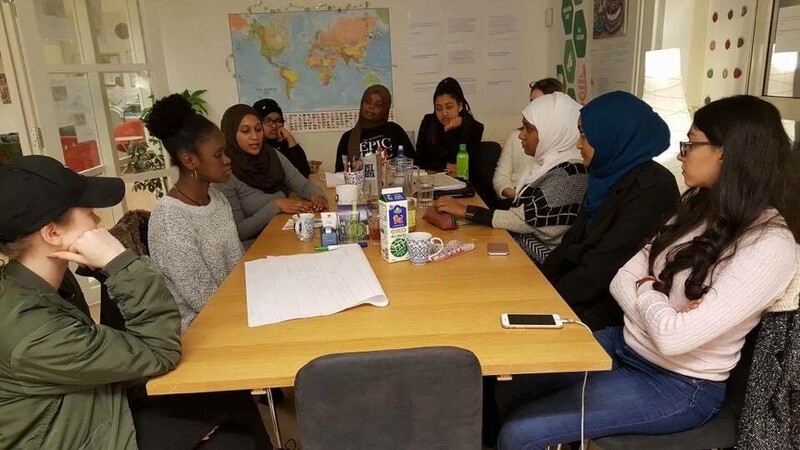 I discovered that “move it” is a project where teenagers can find a place to meet and have fun whilst practicing the Swedish language, acclimatising themselves to Sweden and enabling them to feel that there is a place for them in this country. What made my heart sing is how Rokibath, the woman organising “move it”, is working to find some activities after school for the young people to engage in. Refugees and Immigrant people need guidance, someone who will help them and inspire them to find their right direction. I see “move it” as a path to get out from darkness and injustice and to see in a concrete manner that change is possible. When I read about the organisation on the website and when I was at “move it”, I liked that the organisation seeks to strengthen the capacity of young people to take an active role in change that will benefit all sections of society and work towards eliminating social injustice, and inequality. I am familiar with this. I experience it every day and I would like to be part of eliminating social injustice, and inequality from within. I hope to be able to employ the tools used by “move it” (IM) in the future to make this change possible I met the girls group, shared dreams, hopes and fears with Rokibath, and took part in a refugee fashion show depicting the insecure realities faced by refugees. Rokibath listens, she supports, she helps the young people to practise Swedish, to share stories, to empower each other. They were and remain a source of inspiration for me. Young people have a lot to say, but need a place in which to do so and interested people to listen. Maharlika – the land of the most beautiful beaches, rich wildlife on land as in the sea and a hospitality like nowhere else – was the internship place of us, Myrian Castello and Kathrin Ernst. In Cunarom, Lambunao we facilitated an Oasis Game (Dream Factory / Elos Methodology) in collaboration with the Local Government Unit and discovered that the spirit of Oasis Game is part of the Philippino Culture – Bayanihan. Bayanihan stands for helping each other in the community and is often described with a picture of people carrying a bamboo hut – helping to move an entire house. The community in Cunarom built an amazing playground, planted 80 trees and started the construction of a new canteen. Together we can make our dreams come true! Bayanihan is also used by the farmers we visited. They help each other to plant organic rice seedlings. With farmers, daycare workers, teachers and students from elementary school up to PhD level we conducted workshops of Myrian’s Organization „Fabrica Dos Sonhos“ (Dream Factory) allowing us to learn about dreams, love and education in a different cultural context. We are deeply touched by all the wonderful individuals we met during our journey who became our batas (children), ates (big sisters), kuyas (big brothers), titas (aunties), titos (uncles), nanays (mothers) and tatays (fathers) and are part of our new, big Philippino family. Salamat gid! Thank you very much! Halong! Take care! A little IF news for you all. We have now returned to Tallevana from our Internships and so planning the details of IF will be one of our main priorities from now on. Although we have not seen each other since the end of December, we have been working on the forum from our various internship destinations. The pieces are coming into place, the evening line up is nearly set (AND EXCELLENT), the day schedule is taking great shape and we have received many many registrations (yaaaaay! ), keep them coming! Keep your eyes peeled for announcements, line up releases and general information regarding the IF as we will be posting exciting news in the coming weeks! Register here.